Recently my wife and I moved into a co-op. It’s kind of like a condo but with a few additional restrictions about what you can and can’t do without approval from the co-op board. One thing we didn’t need permission to do was replace the wood flooring in the living room/dining area. The 280 square feet of narrow oak strips was 95 years old and pretty beat, with scratches, stains, and even a few missing boards. Nevertheless we thought long and hard about whether to install a new floor or simply refinish the old one. We’d seen worse floors look good upon being sanded, stained to a medium tone to hide blemishes, and finished with polyurethane. Two years ago, we refinished wood floors in our previous home. It was backbreaking work, messy, and the drying time went on much longer than indicated on the container. When I added up the tool rental costs, I found that we hadn’t saved much. The argument against refinishing, however, goes beyond having to live with the clouds of dust and noxious vapors. The problem was that refinishing would not quiet the symphony of squeaks and groans our co-op floor made when we walked on it. If it were only us, the noise wouldn’t have been such a big deal. But the unit directly below us belongs to a lovely family, and we worried about disturbing them every time we stepped across our floor. Walking in socks and laying down area rugs didn’t help with the squeaking. The floor apparently had a long history of being a nuisance. Dozens of screws had been driven between the boards by former owners in an attempt to silence it. 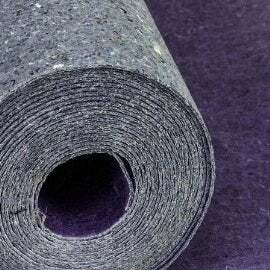 We began to wonder if installing a new floor, such as engineered wood or cork, over the old one would solve the noise problem. 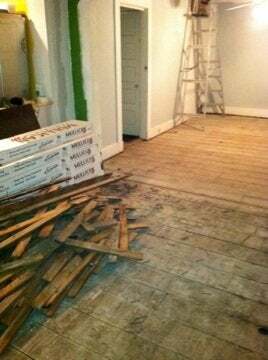 Our flooring contractor felt that the problem had more to do with a loose subfloor than loose floorboards. Rather than chance spending money on a new floor only to find the problem unsolved, we decided to take his advice and remove the old floor altogether. Besides, doing so would mean there would be no change in the finished floor level, simplifying transitions to adjacent rooms. The decision turned out to be the right one. Once the subflooring was exposed, it was possible to screw it securely to the joists. The contractor itemized his proposal, offering to deduct the $280 from his fee if we removed the flooring ourselves and screwed in the subfloor. We had plenty of other tasks (like insulating the attic) on our plate, so we declined. Besides, our power tool-power couldn’t come close to matching the auto-feed screw gun his crew used to secure the subfloor to the joists in just under 20 minutes (a job that would have taken me most of the morning). We did, however, take some time to research underlayments that might provide some additional sound reduction. We settled upon Bellawood Premium Floor Underlayment after reading glowing reviews from flooring contractors around the country. Made from recycled plastic and old tires, it added $250 to material costs, and the contractor didn’t charge us for the additional labor. We also opted for pre-finished flooring. There is no way on earth you can get better than the aluminum-oxide, factory-applied finish that came on this Mullican product. It’s so tough that it comes with a 50-year warranty. I only wish I’d be around that much longer! 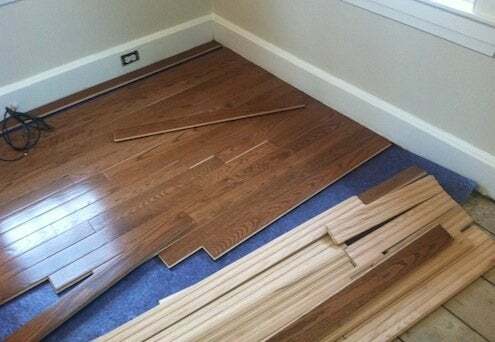 Once the new flooring was stapled in place, not a squeak could be heard. The surface is solid and firm. Total cost (including tear-out and subfloor screw-down) was $7 per square foot, and disruption was minimal. With a pre-finished floor, you can move the furniture in the same day. I hope our neighbors are as happy as we are.